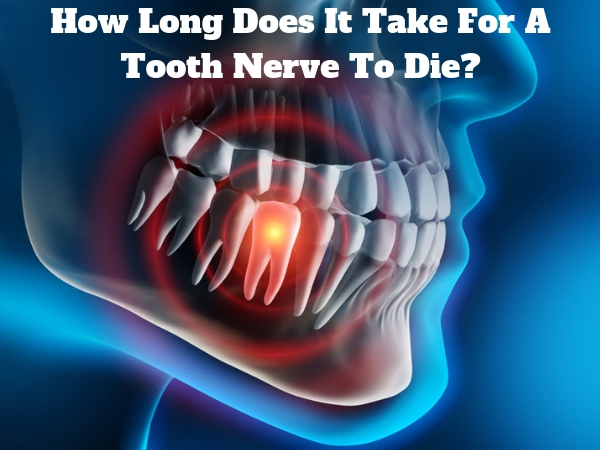 How Long Does it Take for a Nerve in a Tooth to Die? Are you trying to cope with the pain of an exposed or damaged nerve in a tooth? Then you’re probably wondering how long this pain will last before the nerve dies; at least you’ll know when to expect relief. Unfortunately, the short answer is: Every situation is different. Depending on the cause it can vary from weeks to months. To help you understand more and determine your plan of action, let’s explore. What Causes a Tooth Nerve to Die? When bacteria reach the pulp, it attacks the nerve. Over time, if not treated, the nerve can eventually die. When there’s bacteria your tooth will retaliate with an inflammatory response in the form of white blood cells. All of this increases the pressure inside the tooth and can get so intense that the nerve suffocates & dies. Extreme tooth decay that creates a cavity through which bacteria enters. Physical trauma to the tooth that affects blood flow or breaks the tooth. After a tooth extraction, a nerve can be left exposed. Tooth grinding that damages the exterior of the tooth. There’s no saying how long the deterioration will take as it depends on how much bacteria entered and how you treat the problem. You or the dentist can fight off the infection with medicine or herbal treatments. However, if you don’t get the problem under control and fixed it will lead to the nerve dying. During this time, you’re bound to experience a lot of pain. The most common sign of a dying tooth nerve is pain. This is because of the pressure inside the pulp, the infection and many other nerve endings that will become irritated by the problem. Therefore, you may experience swelling in the gums around the tooth. During this time you can use painkillers to make it easier to bare. If the nerve is completely dead you may have less pain, but it’s important to treat the infection and make sure other parts of your gums or jaw aren’t affected. Without a live nerve, your tooth will eventually change color. This is often referred to as a dead tooth. Eventually, the tooth will fall out, but it’s risky to wait for this to happen as you may put other parts of your mouth at risk of infection. Complete extraction of the tooth: This is a more cost-effective option. Doing a root canal: This is more expensive but you’ll still have the use of the tooth afterward. Can You Stop the Nerve from Dying? You determine what is possible by how quick you respond to the problem. In mild cases, if you can ensure the infection is removed and the cavity repaired you may not experience any further problems. If you ignore the problem, however, it will deteriorate and eventually, there will be nothing left but to extract the tooth or do a root canal as mentioned above. We don’t have control over all situations and even a small accident can cause a tooth nerve to start dying. But if we act the moment we suspect a problem, we can save ourselves some pain and even save a tooth. It may be time you visit the dentist. So if you get a root canal, your tooth will fall out in a couple of years? The dentist will assess the damage done to your tooth & let you know whether you tooth will hold up or if you need to get it removed. They will not perform a root canal & give you a crown on a tooth that will fall out within months. Many dentists will do a root canal in a tooth just to make the larger amount of money! Make sure you get several recommendations for any dentist you go to. I had a very strong healthy front top tooth #9 chipped at the bottom.The dentist shaved the tooth all the way down to the gumline and prepped it for a crown.After two weeks the crown fell off and I swallowed the crown while drinking tea.I refused to go back to that dentist and have done nothing concerning this prepped tooth.It has been about 3 months now.The tooth has never had any pain or sensitivity at all.When I tap on the tooth I can feel the tapping thats it.The top tooth next to that tooth I feel alot of sensitivity all the time.How can I defintely know and tell if this tooth is dying or a little dead?If it is dying can I proceed and get the prepped tooth crowned without a root canal since it is not totally all dead and possibly only half dead since I can still feel when the tooth is being tapped or is root canal the best option if the tooth is slightly or half dead?What are my options to save this tooth?